Recipient of a 2008 CES Innovations Award, the iSimple Car Dock Adapter GateWayÖ is the first interface ever to bring the iPodÖ, HD RadioÖ broadcasting, Satellite Radio and many other portable media products into the vehicle. The iSimple Car Dock Adapter GateWayÖ directly connects your iPod to your radio allowing you to browse your music, by Artist, Album, Genre, and Playlist from the radio controls. This direct connection eliminates the need for noisy FM modulated solutions and also keeps the iPods internal battery charged. The iSimple Car Dock Adapter GateWayÖ brings the power of HD Radio broadcasting with the help of the HD Radio Tuner (HDRT). Available separately, the HDRT gives users more channels, more content, in exciting new formatsùall with no subscription fees. The iSimple Car Dock Adapter GateWayÖ can also be expanded with an SCC1 Satellite Radio tuner (sold seperately) or with the iSimple Car Dock Adapter BluStream Bluetooth Interface (Select Vehicles). 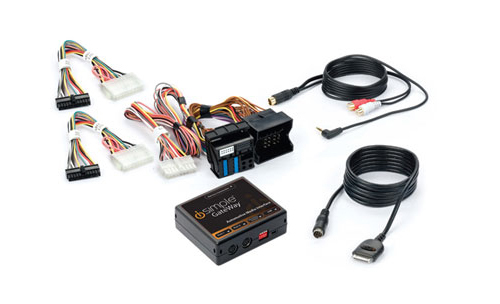 The iSimple Car Dock Adapter GateWayÖ allows connection of any two devices at once: iPod cable, AUX cable, SCC1 Satellite Tuner (sold seperately), HD Radio Tuner (sold seperately) or Bluetooth module. Keeps the Factory Radio Intact û Plug-and-play interface eliminates the need to replace the factory radio, maintaining the vehicleÆs original look and feel. Saves Time and Money û Cutting-edge technology and compact size provide huge advantages over buying and installing a new stereo with similar capabilities. Provides Multiple Entertainment Options û Additional auxiliary input connects MP3 players, satellite radio tuners, DVD players, navigation systems and other portable media to the vehicle. Delivers Digital-Quality Audio û Direct connection to the factory radio ensures static-free, crystal-clear sound from the iPod and many other portable media devices. Enables All iPod Features and Functions from the iPod and the Radio û iPod Interface displays information and provides iPod control from both the iPod and the radio. Works with Multiple Applications û USB connection allows the iSimple Car Dock Adapter GateWayÖ to be continually updated with downloadable firmware to work with the latest applications.